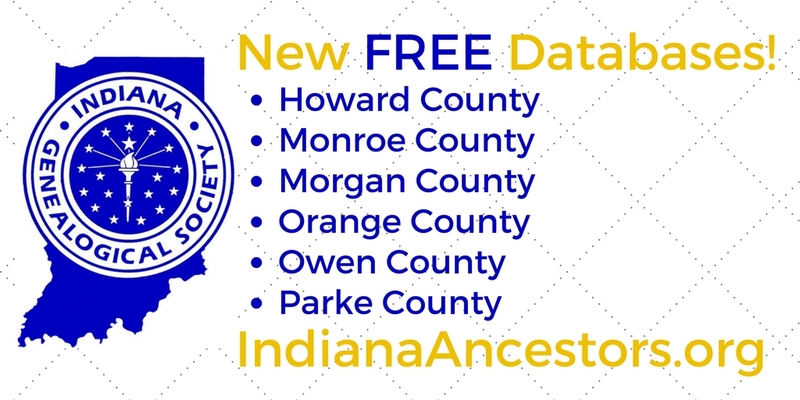 If you have ancestors in Howard, Monroe, Owen, Morgan, Orange, or Parke counties, you should take a look at these new FREE databases on the IGS website. Each of these were made possible through the Indiana Genealogy Digitization Project. IGS provides a digitization kit containing a laptop, flatbed scanner, and a storage device to Indiana non-profits, who use the kit to digitize genealogical materials in their area. Once the organization submits 5 databases to the IGS website, the digitization kit is theirs to keep. You can find all of the details on the IGS website. We look forward to hearing from you! - Muster Roll of 71st Indiana Infantry in the Civil War (1862) - Handwritten muster rolls for Companies C, D, F and H of the 71st Indiana Infantry. - Muster Roll of 97th Indiana Infantry in the Civil War (1862) - Handwritten muster rolls for Axtele's, Dean's and Holston's Companies of the 97th Indiana Infantry. - Graduates of Kokomo High School, Howard County, Indiana (1908) - May 29, 1908 commencement program for Kokomo High School. - Graduates of Kokomo High School, Howard County, Indiana (1910) - June 2, 1910 commencement program for Kokomo High School. - Graduates of Kokomo High School, Howard County, Indiana (1917) - June 1, 1917 commencement program for Kokomo High School. - Graduates of Kokomo High School, Howard County, Indiana (1920) - June 1,1920 commencement program for Kokomo High School. - Graduates of Kokomo High School, Howard County, Indiana (1923) - May 27, 1923 commencement program for Kokomo High School. - Graduates of Kokomo High School, Howard County, Indiana (1925) - May 29, 1925 commencement program for Kokomo High School. - History of Miscellaneous Baptist Churches in Morgan County, Indiana - A typewritten manuscript. - History of Mt. Olive Paragon Christian Church, Morgan County, Indiana - A typewritten manuscript. - Students of Martinsville High School, Morgan County, Indiana (1934) - The 1934 yearbook for Martinsville High School, Artesian 1934. It contains information on students in grades 7 through 12. - Students of Martinsville High School, Morgan County, Indiana (1940) - The 1940 yearbook for Martinsville High School, Artesian 1940. It contains information on students in grades 7 through 12. - Teachers of Martinsville High School, Morgan County, Indiana (1934) - The 1934 yearbook for Martinsville High School, Artesian 1934. It contains information on teachers in grades 7 through 12. 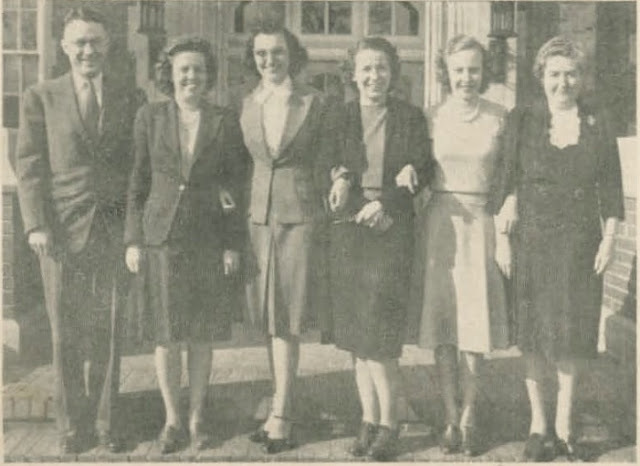 - Teachers of Martinsville High School, Morgan County, Indiana (1940) - The 1940 yearbook for Martinsville High School, Artesian 1940. It contains information on teachers in grades 7 through 12. - Dedication of Quaker Meetinghouse, Paoli, Orange County, Indiana (1954) - A program from the June 6, 1954 dedication of a new Society of Friends meetinghouse in Paoli. - Burial Permits for Gosport Cemetery, Owen County, Indiana (1920-1928) - Original burial permit forms issued by various county health departments in Indiana for burials at Gosport Cemetery. - Graduates of Mecca High School, Parke County, Indiana (1912-1963) - Information compiled and published by the Mecca ARABS and Mecca School Alumni Association in 2011. I am working on digitizing some old audio tapes and I was wondering if anyone there has any experience with it. I am using Audacity to cut the files down and to clean some of them up. Does anyone have any experience with this? I currently have one tape where the audio is good for the interviewer but the person being interviewed can just barely be heard. I've tried to amplify just this speaker's parts, but there is too much background noise and a phone ringing. Does anyone have any suggestions for me? Thank you for your time! Attention Indiana librarians! 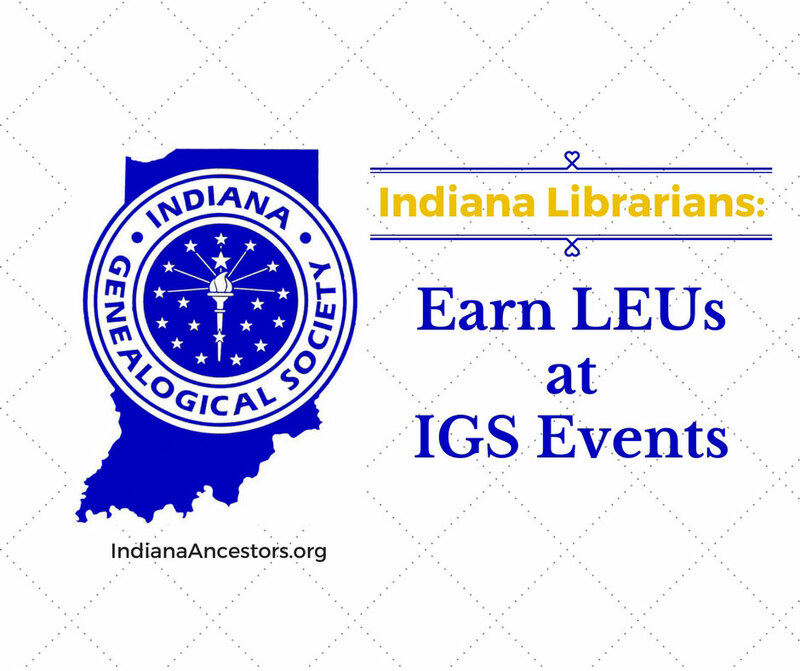 You can earn LEUs at both the IGS Annual Conference on April 8 and the Society Management Seminar on April 7. In addition, Tina Lyons, Ron Darrah, and Mauri Stotts Pratt will present on using County Commissioner records, Indianapolis Public School records, and hidden treasures in Midwestern archives. Tour of the IHS Conservation Lab and the William H. Smith Memorial Library. The Genealogical Society of Marion County would like to identify these two Lawrence County schools. We suspect they are in Guthrie Township. Anyone know? My 3rd great grandfather was born in Ohio and ended up in IA via MO. I'm trying to find information that would show his transit through Indiana and Illinois, and Missouri to Iowa. There aren't any records in census for Indiana that shows him in Indiana. Is there a group I can contact that may have a dialog about the exodus of Ohioans at the start of the civil war moving away from Ohio? Aaron enlisted in the "Nodaway Home Guard Volunteers" in Nodaway, MO, in 5 July 1861, and was relieved on 2 October 1861. My assumption is they had a daughter in the gap, and he went home to run the farm since the war wasn’t so hot at that time in those parts of the country. I’m thinking the Homestead Act of 1861 may have been a reason they left Ohio and headed west plus his brother had slaves in Ohio and that split the family. SLave holders went to KY. Records show Birth of Son James Steven (Stephen) Claypool(1863–1950)10 OCT 1863 • Morrisville, Polk, Missouri, USA. SO he was still in MO until then. Then Aaron had a son William Frances Claypool (1869–1929) 29 Nov 1869 • Clarke Co., IA. SO they were in IA by 1869. I assume they stayed in MO until then, as the Homestead Act called for 5 years in one location. I haven’t found any Homestead land documents as yet. Thanks. I am researching my 4th great-grandfather, Frederick Kysar (many spelling variations of his last name; b. 1761, Berks Co, PA; d. aft. Jan. 20, 1841, Jennings Co, IN) & his descendants. My mother, Kathy (KYSAR) Howard wrote the "Kysar Kin" book. I am in the process of applying to the DAR, & the only evidence I am needing is to prove the "family connection"; needing documents to prove the father/child relationship between Frederick & his son, Samuel (my direct line); but I would also like to prove father/child relationship with all of the other children as well. He & his wife Mary Ann/Meriba (Cornwall/Cornell) had 10 children: Solomon, William, John, Thomas Russell, Elizabeth, Phoebe, Samuel, Jacob, Frederick Jr., & Sarah. Frederick was born/lived in Berks Co PA; moved to MD; married in Jefferson Co KY, lived in Henry Co & Fayette Co, KY; & lived/died in Jennings Co, IN. If you have or know anyone that has any info or documents/records, old family bible records, old family letters, birth/marr/death records, obituaries, old family photos, newspaper articles, church records, cemetery/burial records - please contact me at KysarResearch@hotmail.com. How do I find the genealogy of my Grandmother's family? Her married name was Vera May Hoffman. They lived at 15404 Hoffman Rd. Monroeville, Allen County, IN. I believe her foster name was Hockemeyer, but I am not positive. I know she was a nurse before she got sick and maybe went to Lutheran Hospital for school. I have her nursing coat. From what I know, she was born in 1916 and died in 1972. She had schizophrenia, but I don't think she was ever instatutionalized. I just remember my mother showing me a little wooden shack she lived in with her foster family, and that she thought she might have been Jewish. Browseable listing of businesses, from a 1930 business directory for Indianapolis and the surrounding area. This database was contributed by Wayne Klusman. A list of children born to prisoners at the Indiana Women's Prison in Indianapolis, as published in the prison's annual reports for the years ending October 31, 1886, 1887 and 1888. This list includes the child's name, date of birth, and the date their mother was received at the prison. A list of students attending Hickory Grove School, from a souvenir for the November 14, 1896 through March 2, 1897 school year. NOTE: Hickory Grove School was also known as District No. 7 in Salem Township. A list of graduates of the common school, from a Lockhart Township district schools program for May 1, 1913. NOTE: A common school went up to the 8th grade. A list of graduates as published each spring in the Coatesville Herald newspaper. NOTE: This list does not include any graduates for 1947 or 1950. Browsable list of alumni, as published in the Monroe Township High School's 1911 yearbook, The Oculus 1911. Browsable digital images of students in grade 12 only, as published in "1947 School Spirit, Vol. XLVII, Number 15" (a school newspaper/yearbook). Browsable digital images of teachers in grades 9 through 12, as published in "1947 School Spirit, Vol. XLVII, Number 15" (a school newspaper/yearbook). Browsable list of some of the school's alumni, as published in the school's 1930 yearbook, The 1930 Lyon. Browsable digital images of students in grades 9 through 12, as published in the school's 1930 yearbook, The 1930 Lyon. Browsable digital images of teachers in grades 9 through 12, as published in the school's 1930 yearbook, The 1930 Lyon. A list of from the June 13, 1938 commencement program. This list includes the graduate's name, their hometown, the degree they received and their subject. A list from the June 12, 1931 commencement program. This list includes the graduate's name, the degree they received and their subject. NOTE: Indiana State Teachers College later changed its name to Indiana State University. A list from the college's annual catalogs for the 1896-1897 school year through the 1897-1898 school year. This list includes the graduate's name, their year of graduation, and the degree they received. NOTE: Moores Hill College later became part of the University of Evansville. A list from the institute's annual catalog for the 1912-1913 school year. This list includes the student's name, their home county and home state, and their department. NOTE: Muncie Normal Institute later changed its name to Ball State University. A list from the June 10, 1930 commencement program. This list includes the graduate's name, their hometown, and the degree they received. A list from the June 1, 1952 commencement program. This list includes the graduate's name and the degree they received. Browsable digital images of students in grades 9-12 from the school's 1937 yearbook, Ma-Ho-Hi 1937. From 1916 until 1944, the Indiana Masonic Home in Franklin had its own high school, which was attended by children from all over the state. Browsable digital images of teachers in grades 9-12 from the school's 1937 yearbook, Ma-Ho-Hi 1937. From 1916 until 1944, the Indiana Masonic Home in Franklin had its own high school, which was attended by children from all over the state. From Benjamin Bosse High School 1947 School Spirit, Evansville, Vanderburgh County, Indiana. 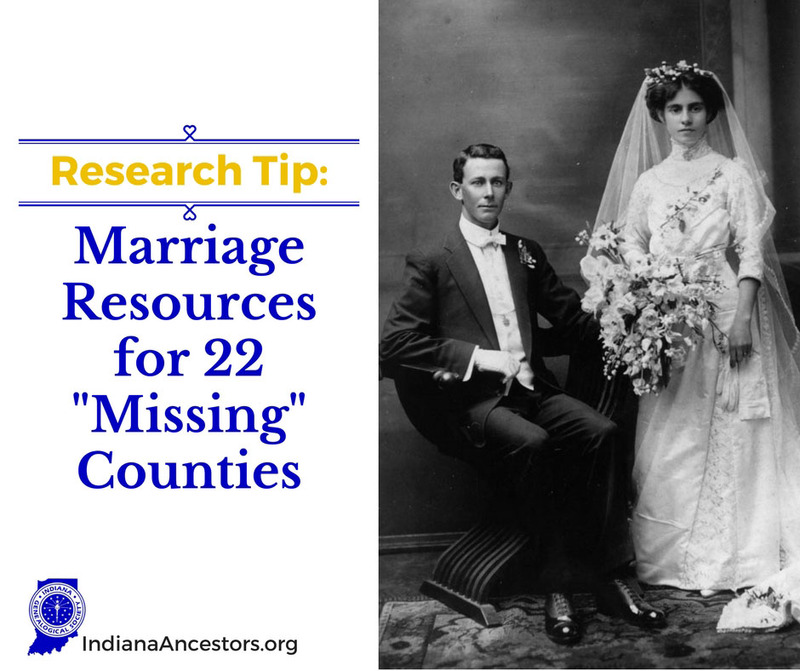 Research Tip: Indiana Marriage Resources for "Missing Counties"
Recently, Ancestry.com added another database for its subscribers - Indiana Marriages, 1810-2001. However, when you look at the explanation/source for their database, you'll see that it is actually the same data that's in FamilySearch's Indiana Marriages, 1811-2007. Cass, Clinton, Crawford, Grant, Greene, Hancock, Jasper, Johnson, Knox, LaPorte, Madison, Marion, Monroe, Montgomery, Newton, Posey, Ripley, Tippecanoe, Union, Vanderburgh, Warren, and White. Among the 22 missing counties are two of Indiana's largest population centers - Indianapolis (Marion County) and Evansville (Vanderburgh County). Indiana Marriages, 1780-1992 (FamilySearch - FREE). Covers 1864 through 1942. Indiana, Marriage Index, 1800-1941 (Ancestry.com - subscription required). Covers 1829 through 1930. Indiana, Marriage Index, 1800-1941 (Ancestry.com - subscription required). Covers 1830 through 1905. Indiana, Marriage Index, 1800-1941 (Ancestry.com - subscription required). Covers 1818 through 1880. Grant County Marriage Index (Marion Public Library - FREE). Covers 1837 through 2006. Indiana, Marriage Index, 1800-1941 (Ancestry.com - subscription required). Covers 1831 through 1924. Indiana Marriages, 1780-1992 (FamilySearch - FREE). Covers 1905 through 1918. Indiana, Marriage Index, 1800-1941 (Ancestry.com - subscription required). Covers 1821 through 1827 and 1833 through 1850. Indiana Marriages, 1780-1992 (FamilySearch - FREE). Covers 1882 through 1932. Indiana, Marriage Index, 1800-1941 (Ancestry.com - subscription required). Covers 1828 through 1920. Indiana, Marriage Index, 1800-1941 (Ancestry.com - subscription required). Covers 1865 through 1920. Jasper County, Indiana Marriages, 1850-1920 (Ancestry.com - subscription required). Covers 1850 through 1920. Indiana, Marriage Index, 1800-1941 (Ancestry.com - subscription required). Covers 1830 through 1845 and 1851 through 1900. Indiana, Marriage Index, 1800-1941 (Ancestry.com - subscription required). Covers 1807 through 1832 and 1854 through 1920. Indiana Marriages, 1780-1992 (FamilySearch - FREE). Covers 1905 through 1915 and 1917 through 1920. Indiana, Marriage Index, 1800-1941 (Ancestry.com - subscription required). Covers 1832 through 1839 and 1850 through 1920. Madison County Marriage Index (Anderson Public Library - FREE). Covers 1921 through 1951. Indiana Marriages, 1780-1992 (FamilySearch - FREE). Covers 1880 through 1923. Indiana, Marriage Index, 1800-1941 (Ancestry.com - subscription required)/ Covers 1880 through 1920. Indiana Marriages, 1780-1992 (FamilySearch - FREE.) Covers 1822 through 1857, 1865 through 1869 and 1874 through 1921. Indiana, Marriage Index, 1800-1941 (Ancestry.com - subscription required). Covers 1822 through 1836 and 1861 through 1925. Web: Marion County, Indiana, Marriage Index, 1925-2012 (Ancestry.com - FREE database). Covers 1925 through 2012. Indiana Marriages, 1780-1992 (FamilySearch - FREE). Covers 1921 through 1933. Indiana, Marriage Index, 1800-1941 (Ancestry.com - subscription required). Covers 1818 through 1835. Montgomery County Marriage Index (Crawfordsville District Public Library - FREE). Covers 1823 through 2001. Indiana, Marriage Index, 1800-1941 (Ancestry.com - subscription required). Covers 1823 through 1850 and 1860 through 1920. Indiana Marriages, 1780-1992 (FamilySearch - FREE). Covers 1860 through 1920 and 1946 through 1951. Indiana, Marriage Index, 1800-1941 (Ancestry.com - subscription required). Covers 1860 through 1922. Indiana Marriages, 1780-1992 (FamilySearch - FREE). Covers 1815 through 1894, 1910 through 1915 and 1918 through 1921. Indiana, Marriage Index, 1800-1941 (Ancestry.com - subscription required). Covers 1815 through 1831 and 1846 through 1920. Indiana, Marriage Index, 1800-1941 (Ancestry.com - subscription required). Covers 1818 through 1850. Indiana, Marriage Index, 1800-1941 (Ancestry.com - subscription required). Covers 1860 through 1941. Indiana Marriages, 1780-1992 (FamilySearch - FREE). Covers 1931 through 1936. Indiana, Marriage Index, 1800-1941 (Ancestry.com - subscription required). Covers 1821 through 1850 and 1860 through 1918. Vanderburgh County Marriage Index (Willard Library, Evansville - FREE). Covers 1920 through 1979. Indiana Marriages, 1780-1992 (FamilySearch - FREE). Covers 1905 through 1906 and 1907 through 1920. Indiana, Marriage Index, 1800-1941 (Ancestry.com - subscription required). Covers 1818 through 1846. Indiana Marriages, 1780-1992 (FamilySearch - FREE). Covers 1846 through 1941. Indiana, Marriage Index, 1800-1941 (Ancestry.com - subscription required). Covers 1830 through 1920. Indiana Marriages, 1780-1992 (FamilySearch - FREE). Covers 1835 through 1875 and 1911 through 1916. Indiana, Marriage Index, 1800-1941 (Ancestry.com - subscription required). Covers 1835 through 1920. Seeking information on Jeremiah Verdeman or Varden Harper, born in Harrison County, IN, October 10, 1811. He died on April 15, 1890, and is buried in Plainville, Daviess County, IN. Do you have a record for a George Lloyd Andrews teaching in Indiana after 1840? Believe he taught in a public school in Muncie and elsewhere. He died in Salamonia in the late 1850s. Any background information would be appreciated. Thanks.